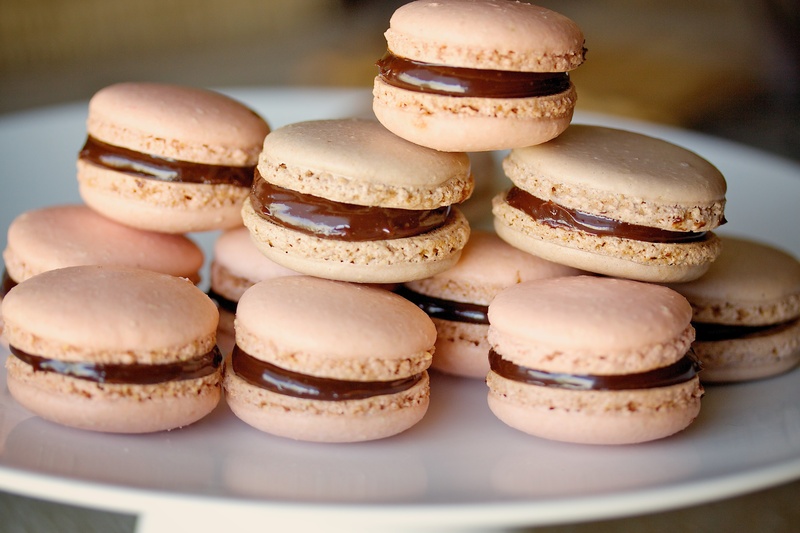 Hmmm, Macarons…they are just beautiful. The colors. The fillings… well the possibilities are endless. 1.Almonds. I’ve made wonderful macarons with either slivered blanched almonds or almond meal. I’m a big fan of Bob’s Red Mill almond meal/flour , however if you are making a big batch it’s economical to buy slivered blanched almonds and do the processing yourself. Blend in your food processor for a few minutes and then sift the mixture through a medium sieve and then reprocess anything left behind. 2. Powdered sugar- I use starched powdered sugar, I heard powdered sugar are not suited for Macarons but it is near impossible to find the non-starch ones in retail stores here in the U.S.
3. Egg whites (Aged) -I separate my eggs and leave the whites in a bowl on the counter covered lightly with a paper towel for at least 24 hours. 4. Favorite Filling- There are so many ways to fill macarons. Fruit fillings, ganache, butter cream. Here are some example. Overall, after testing several batches of macarons under different condition I found that temperatures in the range of 275-320°F for 15-30 minutes produced the best results. It really depends on your oven, I did mine at 320°F for the first 15 minutes of baking. Then lowered it to 300 for 10 minutes. Line 2-3 heavy gauge aluminum baking sheets with parchment or silicone liners (more on this below). Prep a piping bag with a round tip (I use a Ateco #11 for most of my macs, though I’ll occasionally use a #804 for larger macarons). I place the bag into a tall drinking glass (or stout glass) and cuff the bag’s opening over the top, this makes the bag easy to fill hands-free. Weigh out the egg whites into a large mixing bowl (stainless steel or copper), if you’re using stainless feel free to add a pinch of salt, 1/4 teaspoon cream of tartar or couple drops of lemon juice to help strengthen the whites. If you’re using copper you need not and should not add any additional acid (more on this below). Add the food coloring (for the full recipe it usually takes 2-4 drops of gel, for a half batch 1-2 drops does the trick) and mix. Pour the batter into your prepared piping bag and pipe rows of batter (dollops a little bigger than a quarter) onto the baking sheets, giving them space to spread. Tap the pan on the counter to bring up any air bubbles and quickly pop them with a toothpick. Allow the cookies to rest on a level surface for 15-30 minutes. Until they are no longer tacky to a light touch. If you have problems with burst shells, you may need to allow them to rest longer or double stack your baking sheets to provided better insulation from the bottom. While they rest, place an oven rack in the lower 3rd of your oven and preheat to 275-320°F. 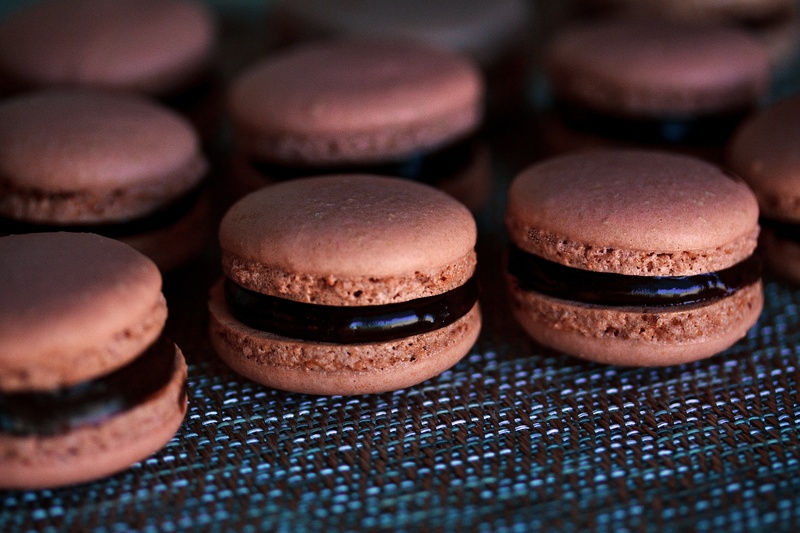 Things that do not make good macaron fillings: Anything moist, runny or unstable! You want your filling to stay put and not break down while your cookie matures. Wet fillings will dissolve your cookies. I’ve seen pastry cream, plain whip cream, and other moist ingredients recommend as fillings. These will result in the sad discovery that your cookies are, or are beginning to become, icky sludge. If you must use wet filling, skip the maturation and eat them ASAP. This is really important. Try not to judge the quality of your macarons until they’ve finished maturation. It fixes a whole host of evils. Small hollows disappear, dry insides can become moist again, the texture improves and of course the flavor, maturation really makes a difference there. Generally 1-3 days in a loosely covered container in the refrigerator does the trick. The more moisture in the filling, the quicker it will mature. Mascarpone, cream cheese, curd-based, caramels and some butter creams will mature first, followed by white chocolate ganache and then chocolate ganache. 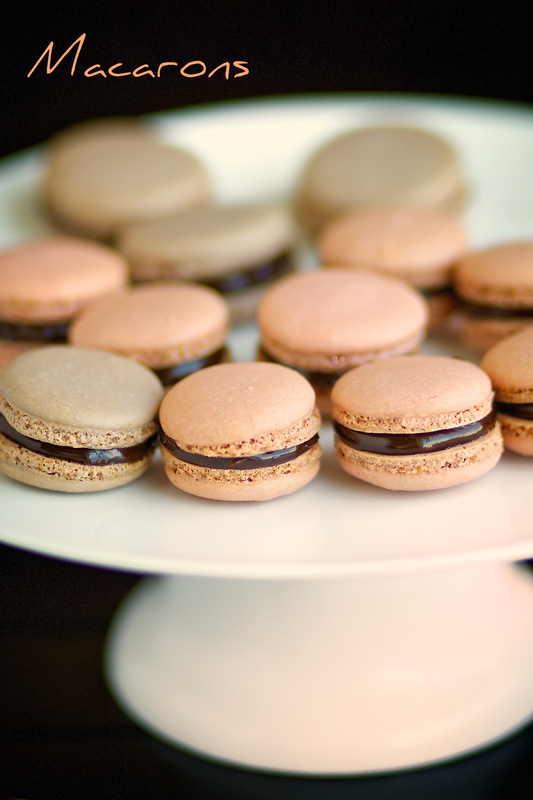 Always bring the macarons to room temperature before serving.